Are you one of many Americans not getting the recommended 5 or more servings of fruits and veggies a day? Dips offer a flavorful incentive to boost your intake. Whether you dunk your favorite chips (make sure they’re whole grain!) 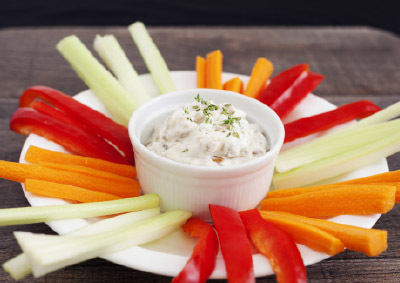 or sink in with fresh veggies, these dips are a great addition to party menus or packed in a lunchbox. They even offer a boost of calcium and vitamin D with the creamy addition of dairy. 1.Heat the oil over medium heat; cook the onions until tender (~15 mins. ), stirring occasionally. Reduce the heat to low. Stir in the garlic, sugar and salt; continue cooking until the onions are turn a deep golden brown color (10-15 mins.). Remove from the heat and cool. 2.Place the cottage cheese, Greek yogurt, Worcestershire sauce and cayenne pepper in the bowl of a food processor. Blend until almost smooth. Add the onion mixture; pulse several times until the onions are chopped and distributed. 3.Transfer to a serving dish, cover and refrigerate for at least 30 minutes. Sprinkle with chopped chives before serving. 1.Blend the cottage cheese until slightly lumpy. 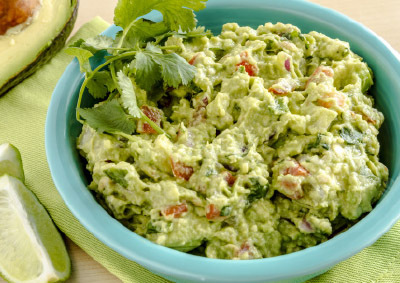 2.Mash together the avocados, lime juice, tomatoes, and garlic in a medium bowl. 3.Combine the cottage cheese with the avocado mixture. 4.Chill if desired to blend flavors before serving.